CRM (customer relationship management) is a real buzzword of today’s business world: everybody is talking about CRM, almost everyone knows that they can significantly benefit from it, yet only few know which solution fits their business model best. It doesn’t matter if your company employs 10 people or more than 100 people – today you already understand that the new technology called CRM is a tool that is going to help you establish closer connections with your customers, provide professional customer service, sell more and grow your business further. When it comes to choosing CRM software, it has to be affordable, it should be able to help you right here, right now; it shouldn’t be complicated; it should target your unique business needs and, it should be accessible day-and-night. So, if you are one of those 72 percent of small business owners who think that investing in modern technology, such as CRM, is going to result in a bigger ROI and help you grow your business, then let me help you steer through these unknown CRM waters and find the CRM solution that fits you best. But, before we get into that, watch this short video that will show you why cloud based CRM is best suited for your business. Cloud-based CRM (or cloud CRM) means that a Customer Relationship Management (CRM) software is hosted in the cloud. Cloud-based CRM software can be accessed through the Internet, making it easy for all users to access the same information at any time. And as information is stored in the cloud, you and your team can also view customer information on the go by accessing the CRM data through mobile or on your tablet. Gone are those days when the word “CRM” brought to mind an image of a bulky and expensive software that requires an entire team of IT experts working solely on installing and maintaining the system. Today’s CRM systems are not only more technologically advanced and user-friendly, but they also come in a variety of solutions that are designed to address unique needs of all types of businesses – big or small. Just like everything in today’s IT world, contemporary CRM systems now offer new possibilities, flexible costs, as well as easy maintenance and deployment. In other words – things have changed. Even the term “software” has moved from its previous earth-bound domain all the way to the Cloud. And this is exactly in the Cloud where your business should look for their CRM solution. IT Cloud services in general have seen an impressive lift-off recently. The International Data Corporation (IDC) reports that the spending on cloud services will continue to grow in 2019, which stands for a 23% growth compared to 5 years ago. Here are 8 reasons why Cloud-based CRM software is something that all companies should seriously consider if they want to grow their businesses further. A deep-rooted fear that CRM comes with complex installation process is no longer valid. A modern Cloud-based CRM is, in fact, “IT worry-free”, and you can be up and running in no time (no business case required, but if you do need one you can find it here). All you need is the internet connection. Then, you sign in online and use it. Simple as it is. You don’t have to pay for hardware, server and software maintenance. Nor do you need to have a permanent IT person on site, worry about complex installations, data migration, or even upgrades – all this is done remotely for you. Round-the-clock accessibility is by far the greatest benefit of Cloud CRM. Imagine that you need to make some urgent, yet game-changing sales calls while on-the-go, or send an amended sales proposal, or quickly find a contact’s phone number or an e-mail when you are out of the office? Cloud CRM gives your access to the system from anywhere – in the office, on a train, in a café, at home; and on any device – be it a desktop, a laptop, a smartphone, or a tablet. Again, all you need is the internet. Your colleagues and you can access the centralized database at any time, even outside working hours if need be, which is particularly handy for any modern business. By always staying connected to the central database, Cloud CRM gives you the flexibility and freedom to do what you need to do when you need to do it. It can’t get easier than Cloud CRM usage. First, you buy a software package at a fixed monthly price. All you need to do is log in with the access codes provided, and make sure you have a reasonably fast Internet connection at all times and a device you prefer to work on. As to system maintenance, it is provided by the vendor and accompanied by a wide range of self-service online services. Another benefit is that this business-enhancing product certainly won’t break your bank. No business likes to allocate big sums of money for a one-off purchase, and smaller, regular installments are usually preferred. Typically Cloud CRM operates on the pay-as-you-go subscription model, which requires minimal upfront investment and, as a result, reduces risk. Also, there are no hidden costs like buying additional hardware or licenses fees. What you pay is a set monthly fee for a Cloud CRM package, which can be as low as €37. A very serious concern for any business using web-based information storage systems is, of course, security. 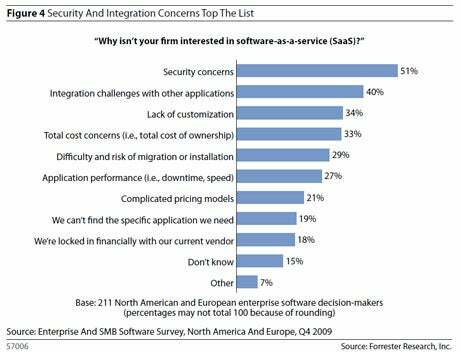 As shown in the chart by Forrester Research below, the most common reason why businesses are wary of adopting a cloud solution, also known as software-as-a-service or (SAAS), is security concerns. Companies that offer CRM systems online know that very well and take security issues very seriously. In the end – it is they who are responsible to protect the confidential information that you trust them with. Not surprisingly that information security levels at Cloud servicing companies are much higher than those provided by an average local IT room. Providers of Cloud CRM also offer advanced automatized back-up policies and have clear data recovery plans if a breach happens. Yet, individual users of Cloud services can further improve their data safety by using two-step authentication and strong passwords. This has become even more important since the introduction of GDPR on May 25th 2018. With Cloud CRM such situations almost never occur, as all parts of the Cloud are backed up. Meaning that every component, for example – a server, has multiple replicas in the Cloud. So, if something fails, it will be immediately replaced and the system won’t get disrupted. In fact, a web-based CRM system continues to be operational 99.99% of the time – the rate reliable enough even for the fussiest of the businesses, don’t you think? What can be better than owning a product that is tailored for your needs? When adopting CRM systems, small businesses are likely to start with only the features that can help them in their current work and that are relevant to their unique needs. However, as your company grows, you may decide that you need, for example, more capacity, new features or more advanced modules. In this case, Cloud-based CRM can be instantly updated to satisfy your new needs. And you won’t have to wait until a new program is written for that purpose. The bigger, better and more innovative CRM can be provided to you straightway. Stand-alone products have little chance of success in today’s IT world that demands flexibility of integration. Especially in a modern business environment, information exchange between already available technologies is paramount. Why would anyone invest in a software that cannot open your documents, save your contacts or be able to integrate the e-mail system that you’re using? That is why compatibility with other products and services is the key to ensuring CRM’s longevity and effectiveness. Cloud CRM can be easily integrated with other applications or software, such as e-mail clients and Office products (Word, Excel, PowerPoint, etc.). It is this compatibility that makes Cloud-based CRM an even more appropriate choice for businesses looking for a modern-day CRM solution. Here you have it –eight powerful reasons why Cloud-based CRM is the right choice for your business. and, as a result, increase your customer retention rates. adaptable to your needs and changing requirements. The only thing now left is to choose the CRM vendor wisely. Make sure that the vendor offers a flexible Cloud solution that is able to grow with you as your business grows, and that the solution is tailored to your needs in terms of functionality. Now that you are equipped with this knowledge, you’d be able to find the Cloud that will take you high and far in growing your business. 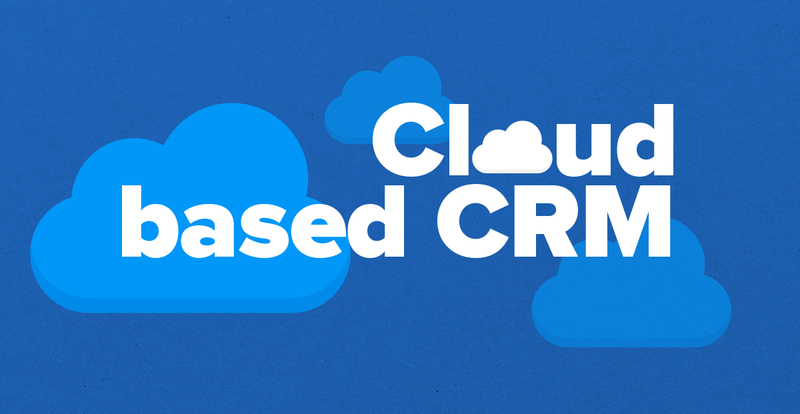 Do you want to find out how cloud-based CRM can impact your business? Request a personalized demo by clicking the link below. A former linguist, PR specialist, journalist and editor, Zarema Plaksij now works as an editor and contributing copywriter in SuperOffice. Keen on creating engaging content for the company’s existing and future customers, Zarema is ‘head over heels’ for digital content marketing and brand journalism. You can connect with Zarema on LinkedIn. Cloud based CRM has so much to offer a small business, and gone are the days when cloud management is complicated and expensive. There are now cloud solutions that are simple to use and easy to navigate without breaking the bank. Imagine being able to open up documents and other required files easily anywhere without having to worry about installing so many programs in order to view a file. The possibilities of improving your business with cloud management is endless. Great points, thanks for sharing. Cloud-based CRM is a brilliant and innovative initiative for organizations to use in improving customer relations, enhancing customer satisfaction, improving marketing, and raising profitability. Once you have a customer, the next step is to get them to come back. I have heard that that is where a lot of car sales come from. Returning customers can be a great source of revenue. 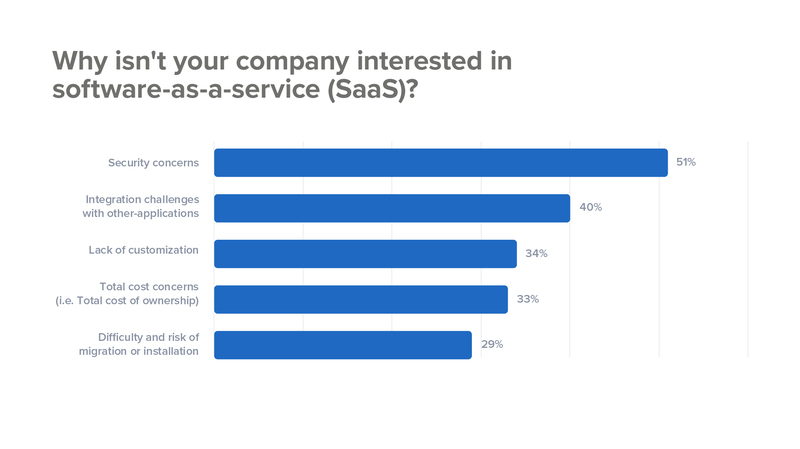 For this reason I agree with the article that cloud-based CRM will help you have instant access to insights about sales opportunities with previous customers. Zarema Plaksij, Perfect 8 points explained in an excellent manner. Cloud compatibility is a must in case of CRM software. Thanks for sharing. Rightly said. Even small businesses should start considering cloud based CRM as it not only centralizes the data but its affordable and highly secured as well. Nowadays, Cloud-based CRM is a smart way to save time and manage lots of data. Instead of using and re-entering important information into multiple tools, many times over, small businesses can save money and focus on enhancing relationships with customers. Customer relationship management (CRM) software uses data aggregation to manage relationships with customers. When your small business uses cloud-based CRM software, opportunities to increase sales and provide quality customer experience increase substantially. Cloud based CRM are the best solution for all the IT firms. It's lower in cost, easy to use and highly secure. Nowadays, almost every company adopting cloud computing services for better results. Zarema, great article! I enjoyed reading this useful information. Yes, cloud based CRM's are a great solution for all firms. It's secure and Cloud CRM typically offers access to the application via Web-based tools (or Web browser). Employees can log in to the CRM system, simultaneously, from any Internet-enabled computer or device. And often, cloud CRM provide users with mobile apps to make it easier to use the CRM on smartphones and tablets. Thanks for an informative post, Zarema. Thanks for sharing. Mobility is an area which must be covered by all CRM software and glad to know you have mentioned it, The accessibility must be there to provide better and user friendly software. 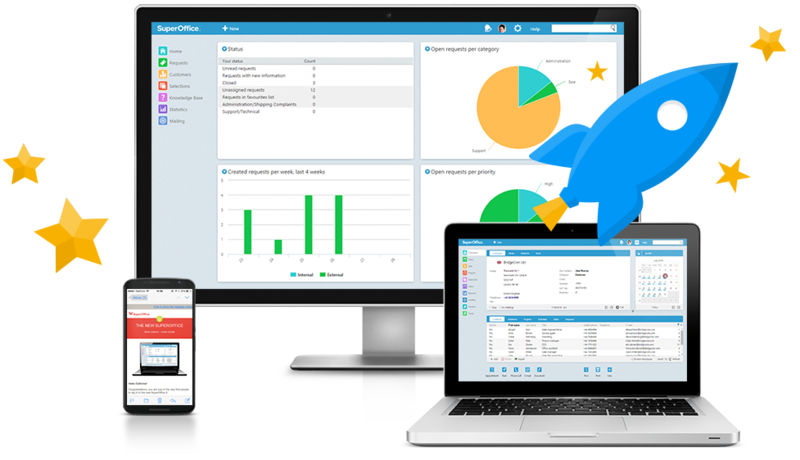 Cloud Based CRM enables customers to manage their sales operations effectively, get deep business insights easily with powerful analytic dashboards, thus gaining easy business visibility and assisting in quick decision making. So it will help Every business owner who wants to know at a glance how things are going. A cloud-based CRM is a hosted solution offered by a third-party vendor. This means that unlike traditional on-premise CRM systems, you don’t have to buy a license for any software or bear installation expenses. Instead, you need to purchase a cloud CRM subscription, which can be treated as an operational expense. Very informative article. Thanks for publishing. Cloud-based CRM is really very helpful for any business as it gives the freedom to access from anywhere. Again, thanks for publishing the article. Great blog! Cloud based CRM is definitely the way to go for small businesses. I really appreciate the information. Thank you! Great post! Well-written and really useful to learn why cloud CRM has become so popular! CRM software is consistently helping companies to boost their sales process and turn it into more revenue driven process. However, just like you point out in the article, the real benefits of CRM lie in the cloud! Great article! Thanks for sharing with the concise post!! Wish a found it a bit earlier.